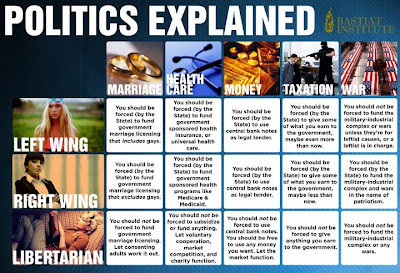 As you might know, the libertarians are a political party in the USA which is different from the Democrats and the Republicans in the sense that they aim to implement a small government which fosters true liberty, and who's main role is to protect everyone's liberty. I consider myself a libertarian, although I do have a slightly different point of view when it comes to health care. 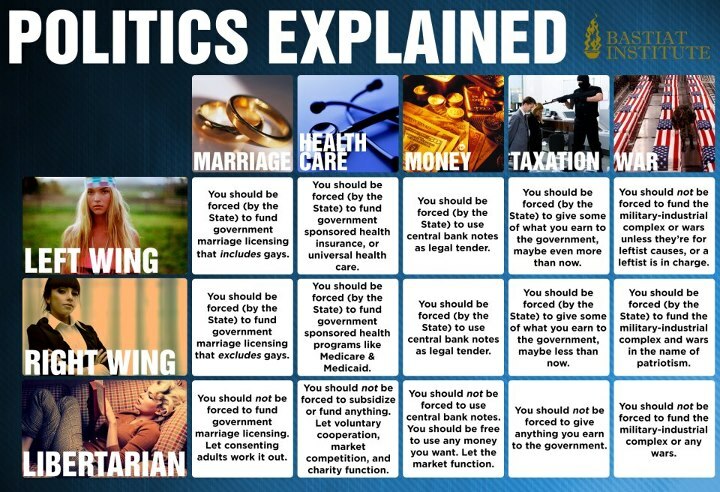 Eduardo Born: The cell for health care and libertarians is incorrect, though. Health, security (internal to the country, protecting individual liberty) and education are government matters since they are the foundations that enable people to make conscious choices. Friend: Disagreed, government cannot make you healthy, secure or educated. Everything that government "provides" must be taken from someone else (using force or the threat of force.) The one thing that I want government to do is protect my individual liberty, yet government is the greatest violator of exactly that. Confiscating someone elses wealth will not make me healthy. If someone breaks into my house right now, all government will do is conduct the autopsy. I wouldn't trust my children to the governments "one size fits all" indoctrination system for anything. Eduardo Born: While I do agree with what you said, it is in contradiction with the part where you say the government cannot make you healthy. The problem is that health care is not a matter like others. When faced with the need for health care, in case you decide to getting treated is good for you, you will be either in the government's hands or, like today, in big corporation's hands. In order to be free everyone needs to have access to a degree of health care. Government is out of the picture today and we all know it only works for the wealthy. Free market helped none in this matter because people depend on it, so cartels are formed very quickly. When it comes to getting an antibiotic that will cure a prostate infection, which is very easily treated but extremely painful and deadly if left untreated, one size fits all. That pill will come from someone else, true, but when you are the one getting it you will be thankful it did. And when your tax saves some else's life most people would be glad they did. Friend: I would rather be benevolent by choice than have it forced on me. Forced benevolence is not benevolence. I disagree completely on your assessment of healthcare. Companies started offering healthcare benefits during WWII because the government forced a freeze on wages and the only way they could attract employees was by offering better benefits. Then the government forced Medicare on us and it went straight downhill from there. I have spoken to older physicians (pre-Medicare era) who took barter for their services and didn't take payment from those who couldn't afford it or offered to let them pay later. The reason healthcare is so expensive is because government subsidizes it, not the other way around. Eduardo Born: I agree that benevolence is the key, and ideally people would act like that and help others. But that is an unrealistic expectation for these days. The humans currently inhabiting this planet are not, for the most part, benevolent. Regardless, others will still need that antibiotic, though... therefore the need for it to be forced, in a way. If you agree that a few dollars of yours could be used to help someone in need for health care, be it your own children or a total stranger, then having the government collect it and use it for that matter doesn't feel forced anymore. Medicare fails because of it's limited eligibility, lack of coverage even for those eligible and the fact it builds on top of cartels already existent such as how medial supplies are charged on health insurances in general, including Medicare. A hospital can charge $11 for a single Tylenol pill, and Medicare will pay for it without taking into account that that pill came from a box that coasted $2 and had 25 pills in it. Just an example, of course. Friend: If it was only a few dollars, I might agree. If you add all taxes together (federal, state, county, city, property) Americans pay more than half of their income in taxes. They work more than half the year to pay taxes. I disagree with your assessment about benevolence. Despite an onerous tax burden, Americans are still among the most benevolent people on the planet. Imagine how much more benevolent they would be if 100% of their income was theirs to distribute. Friend: Having the government collect it results in an automatic decrease in the distribution because the government keeps part of it to pay the people who collect & distribute it. Eduardo Born: I agree that taxes are too much. Also agree that having someone in the middle adds burden to it, but even if people would just distribute their wealth to help others, someone would still need to collect and make sure that wealth gets used for the intended purpose, and that person would still need to eat, etc, so part of that money would be kept as well. Certainly the current taxes are abusive. But that doesn't diminish the need of someone who is sick for health care. While I agree that Americans are benevolent, people are busy with their own lives. And that is just normal. Someone who would eventually give away the antibiotics someone else needs might not even know about that need. Maybe if that person would knock on the door and ask for help, they would help. But that's now how we want things to work, right? So people pay some tax so this matter can be taken care without the need for the person who is receiving the benefit to knock on their door. And that activity of collecting, etc, consumes part of the money, true. Still, need to be done. Friend: If you want to see affordable health care, get the government and the insurance companies completely out of it. Eduardo Born: Now you're talking! But, that could not be done with a free market. People want to make sure they *will* have health care, so they buy health insurance. Because the free market is free, providing insurance is not illegal. So to take them out of the picture you would have to break the free market, which is one of the pillars for the libertarians like me and you. Friend: Health insurance is not insurance. It doesn't resemblance real insurance like auto or home in the slightest. It's actually prepaid healthcare. Not insurance at all. Eduardo Born: Very true. But all insurances are like that. 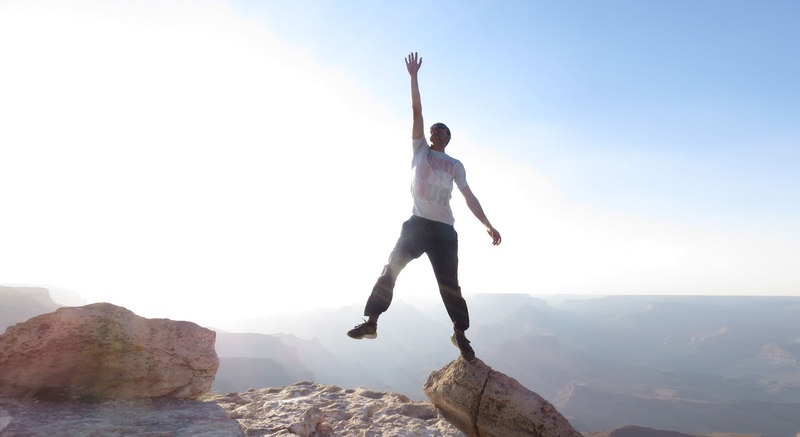 You always pay a little more than what you would, in average, if you would use the insured service forever. If your house burns and you don't have insurance, you are free to work and buy a new one. But if your body is not healthy, you can't work things out. That's where health care is different from other services. Friend: I agree healthcare is different, but I am talking about health insurance. What you can do is having someone who is interested in people's well being competing together. That someone would, in theory, be the government. No company is interested in anything else other than profit. Friend: I agree. A free market might have health insurance. But it would be insurance more like auto and home where you have to pay the deductible on every claim, not yearly. Eduardo Born: Not that the government is not a company, of course it is. but you know what I mean. But you still pay a premium to have the auto or home insurance, regardless of making claims or not. Friend: That's exactly the point. Governments motivation is not the same as a private company. The premium is much lower when the deductible has to be paid every time. Eduardo Born: ahan!! true! But, what if your problem is a brain cancer and you can't pay the deductible? Health care must be accessible to all individuals, not just those with enough money to fix their own problems. If you have a brain cancer I'd be happy to know my tax dollars helped you, even if I paid much more than the benefits I received myself. That's where the benevolence comes in! If Americans are benevolent, then no problem in having health insurance (which means guarantee of service when needed) coming from the government! Friend: Again, forced benevolence is not benevolence. Eduardo Born: But it still solves the problem of who is in need! Friend: Excellent. Who is to decide who is in need? Government? Eduardo Born: Oh, the "need for a service" is a complex topic, we could probably talk for hours on it alone. But in the case of health care is actually simple. The need is determined by the patient and, later confirmed or dismissed by the physician. Friend: The "need for service" is a complex topic only if someone else, i.e. government, is trying to decide your need for you. If you are deciding for yourself, it's much simpler. Eduardo Born: Right, but you know how some people are. Some people will try to take advantage of the system whenever possible not taking the environment or other people into account. So some sort of auditory must exist to prevent abuse. That is dangerous, of course, since most kinds of auditory are an abuse themselves. Therefore the complication. Friend: You can't take advantage of a free market. The federal government tries to cut down on Medicare fraud and abuse and gets bigger trying to fix the problem it started in the first place. Eduardo Born: Right. But free market gets us back to the problem where people can't pay the deductible but still need health care. So they buy health insurance. And if anyone should provide health insurance it should be an entity not moved by profit alone. And in our society the only entity like that which could do something in an organized and transparent manner (I'm saying it could, not that it does that today) and in such a scale is the government. Friend: Health care wouldn't cost a fraction of what it does in a truly free market. Tell me one thing that government does right. The reason healthcare costs so much is because of government and insurance companies. Eduardo Born: Agreed.. but because health care is an essential, not an optional service, people want to make sure they have it. So they buy insurance. And like we discussed before in a free market you can't prohibit someone from providing any kind of service, including insurance. It is an unavoidable evil. The reason it costs so much is because it is abused of. The $11 Tylenol pill makes it cost so much. Medical supplies and services should have a ceiling to how much they can cost because everyone must have access to it. It's not optional. Cartels should be tracked down and prevented. How about you. What are your thoughts on health care? Should the government be involved or not at all? I disagree with the polarity in the image in question. I don't disagree with the discussion, although the points made are again polarizing. Hi Dadawa! I guess is just hard to defend a point of view without polarizing somewhat, but as long as it is a discussion of ideas and not vague opinions then I think is constructive. Anything after beer 3 would be solving the world problems in three easy steps... until the hangover hits and we realize what idiots we were! Does not mean it should not happen! After seeing some results I realized I wanted to tone my muscles which can also produce faster results. So I sought out to find my self mainly a strength training fitness workout. Look for all natural or herbal remedies, and see your doctor for their expert opinion before taking any type of medication. You don't want to have any adverse side effects from an over the counter diet drug. Protect your health first by consulting a physician. health is so much important. For this celery juice can be quite effective as per I know. As a matter of first importance, you have to test your state of hearing so you can make sure about the issue you may get. For this situation, it is imperative for you to see an otologist or audiologist who is master in this thing. Hopefully you are getting an awesome reaction. For celery juicer you can count on it. See you other side.